(Bloomberg) -- The risk of an unexpectedly weak yen next year cannot be ruled out, and would mean a chunky rally for Japanese equities, according to JPMorgan Chase & Co. The Nikkei 225 Stock Average could hit 28,000, about 25 percent higher than current levels, if the yen weakened to 125 per dollar, strategists including Ryota Sakagami and Tohru Sasaki wrote in a note Thursday. While this is not their base case, such a scenario is not impossible, they said. 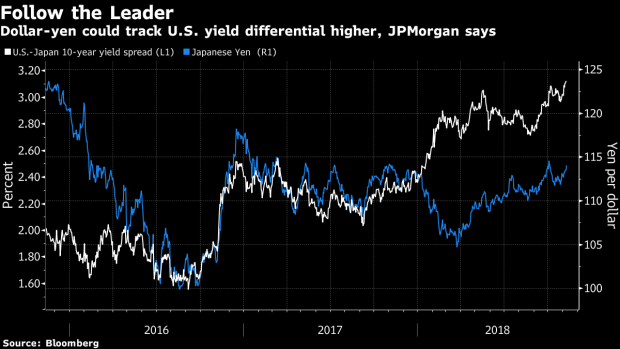 A deteriorating trade balance, high oil price and further widening of U.S.-Japan interest rate differentials would all contribute to pressure on the Japanese currency, according to JPMorgan. Should Japan post a trade deficit in 2019, and the gap between 10-year bond yields in the two countries widens by a further 30 basis points, the dollar-yen could rise to its 2015 highs of about 125, it said. Japan’s exports unexpectedly fell in September -- the first drop in almost two years -- as natural disasters disrupted economic activity, while higher energy prices continued to feed gains in imports. Still, while economists expect import growth to overtake that of exports in 2019, according to a Bloomberg survey, analysts predict the yen will strengthen, finishing the year at 108 per dollar. The yen traded around 114 per dollar Friday, down just over 1 percent against the greenback so far this year. Meanwhile, the Nikkei 225 Index traded around the 22,300 level, down about 2 percent in 2018. A slump in the yen would boost the gauge’s aggregate earnings per share for the coming year by 11 percent, principally lifting stocks of domestic-demand driven cyclicals and exporters that are sensitive to exchange rates, JPMorgan said. The bank highlighted the transportation, raw materials, and precision instrument sectors as among the most responsive to a weaker yen.